Here is a perfect idea for adding a handmade touch to those store bought Valentine’s boxes or perhaps even upcycling it to be filled with goodies again! And it’s sooo easy! I used a crochet bow pattern to embellish this one. Crochet a chain just a smidgen longer than your box. Row 1: Work 1 sc in 2nd chain from hook and each chain across, turn. Row 2: Ch 1 (does not count as st), work 1 sc in each st across, turn. Rows 3 and 4: Rep Row 2. Ch 34, join with a Sl st in 1st ch. Round 1: Ch 1 (does not count as st), work 1 sc into the back ridge of each chain around, join — 34 sts. Round 2: Ch 1 (does not count as st), work 1 sc in st around, join — 34 sts. Flatten cylinder just made and wrap the yarn around the middle of the cylinder to create a bow, keep wrapping until desired effect is achieved. Fasten with a knot in the back and snip ends. Now it’s time to put it all together! If you box has any kind of design or branding, you can cut some construction paper or cardstock to shape and glue it on your box. 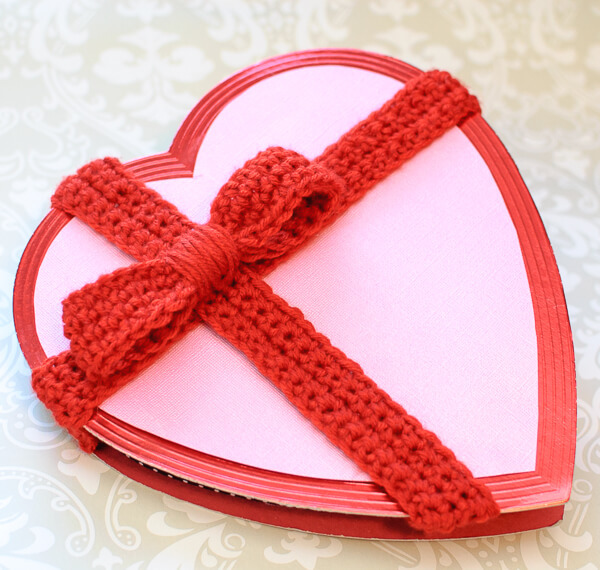 Then criss cross your crocheted “ribbons” on top and glue down. Lastly, fasten your bow with a dab of glue. That’s it! You can of course embellish as much as you’d like … think stickers, washi tape, glitter … ! So adorable! This would be cute for other holiday/birthday gifts too.